This weekend marks the worldwide release of Sully—the Clint Eastwood-directed feature film starring Tom Hanks as Captain Chesley “Sully” Sullenberger that retells the story of Flight 1549 and “The Miracle on the Hudson.” The film has opened to favorable reviews from audiences and critics, praised for its passionate take on the national story. Eastwood, along with the cast, does an amazing job capturing the heroism surrounding the events of January 15th, 2009, and the after effects like media rounds and an intense investigation. The film stands not only as a reminder of the bravery of all of those involved in the historic rescue effort, but a great homage to New York City. Many people wouldn’t associate Rhode Island with the incident, but there is a direct connection. Although many of the details are hidden due to filming and scheduling logistics, Block Island Ferry’s own M.V. Athena was right there on the scene. The boat happened to be chartered to work on the Hudson during the winter of 2009. Captain Carl Lucas and his crew were one of the first of many ferry boats to respond to the water landing. That’s right—your favorite high-speed ferry was, in fact, the boat that rescued Captain Sully himself, along with co-pilot Jeff Skiles, and 17 other passengers. While the movie is an amazing tribute, we understand that it simply can’t capture all of the details of the rescue. With well-deserved respect to Captain Sullenberger, his crew, and everyone else involved, we here at Block Island Ferry would just like to acknowledge how proud of our incredible crew we still are. And we want you all to be proud of them as well! In the film, Hanks delivers a monologue taken from actual comments by Sully, remarking that all of the people involved in the rescue, including the ferry boat crews, were heroes. In another scene, Hanks’ Sully delivers a statement to Aaron Eckhart’s Jeff Skiles: We did our jobs. We think the truth is somewhere in middle of those two thoughts. In Rhode Island—in New England—at Block Island Ferry, we don’t ask for credit, much like Sullenberger and Skiles. We simply master our craft and when there is a chance to use those skills, we answer the call. It’s not because we are heroes, but because we are prepared. The pilot’s words even echo one of the beloved slogans of the New England Patriots, which reminds each player to “Do Your Job.” If that doesn’t speak to our values, we don’t know what does. The Block Island Ferry is a New England tradition. While the M.V. Athena’s likeness makes a brief appearance in the movie, the instinct displayed by the crew in real life is something that we see daily. Our employees are skilled, ready, and qualified to react and keep people safe, in any situation. Capt. Lucas himself, a South Kingston, RI native, has 25 years of experience on the water. Chris Myers, our Port Captain and Operations Manager has been with us for 27 years. He oversees rigorous training, weekly drills for emergency situations, and confirms that we are in compliance with Coast Guard regulations. These men, along with the crew and staff at Block Island Ferry, embody the “Do Your Job” philosophy. There is a culture of coordination and safety here and that was exhibited on January 15th, 2009, as it is today. No one ever wants to be put into a position where they are forced to save people lives—but things happen. Like Capt. 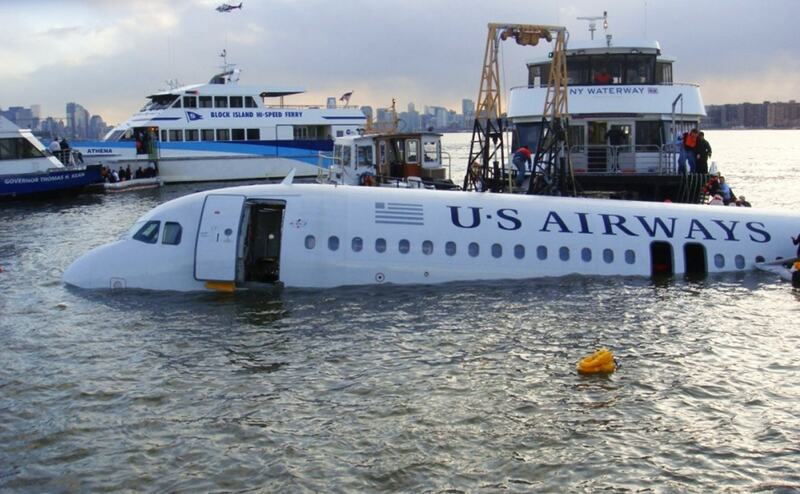 Sullenberger, we trust the years worth of experience piloting our vessels and working on our docks. We do our jobs and we hire the best people to do their jobs so that you can trust them, too. When you watch the film and see the heroics, remember the experience needed to execute such a successful rescue. Remember that you are in good hands when you travel with our crew. Sail away, have fun, and leave the safety to us.